Home Secretary Amber Rudd has signed an order for the extradition of a man with autism to the US, where he is accused of computer hacking offences. 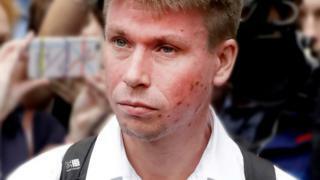 Lauri Love, of Stradishall, Suffolk, is accused of hacking into the FBI, the US central bank and Nasa. The family of the 31-year-old, who has Asperger's syndrome, said they would appeal against the decision. Mr Love has previously said he feared he would die in a US prison if extradited. Last month, a judge at Westminster Magistrates' Court ruled he could be sent to the US to face trial. His lawyers said he could be sentenced to up to 99 years in prison if convicted. Two months ago, a court ruled that Lauri Love should face trial in the United States. He's accused of hacking into the FBI, the US central bank and the country's missile defence agency. Lawyers for Mr Love said his mental health problems meant he should not be sent abroad, but US prosecutors said that was an excuse to escape justice. Amber Rudd, the Home Secretary, has now signed an order for the extradition to proceed. The Home Office said Ms Rudd made the decision after "carefully" considering all relevant matters. Mr Love is expected to appeal. His father, the Reverend Alexander Love, said the Home Secretary had written to his son. He added: "My sense is they are saying it is not their fault. They have created procedure [for extradition] that they can't control. "We will be appealing. We are talking to our lawyers. It was going to happen - it was inevitable - but it's still painful. I cannot begin to express how much sorrow it causes me. "All we are asking for is British justice for a British citizen." Tor Ekeland, Mr Love's US lawyer and an expert in hacking cases, said Mrs Rudd was "boxed in" by UK legislation and would have found it "very hard" to justify blocking the extradition. He told Iain Dale on LBC: "He does have an appeal to the High Courts. We have one more shot at it in the UK." Mr Ekeland added that he feared that Mr Love would face a "way harsher environment" in the US following Donald Trump's election. Barry Sheerman, one of the more than 100 MPs who have signed a letter calling on US President Barack Obama to block Mr Love's extradition, said he was "deeply disappointed" at the decision. Mr Love was first arrested at his Suffolk home in 2013. He had computer equipment seized by British police, but the UK investigation into him was dropped.